On the 23ed of January, Trump's "government shutdown" began to fall into chaos. As the government prepared to miss a second paycheck Federal workers swarmed the Hart building chanting "No more food banks we want a paycheck!" 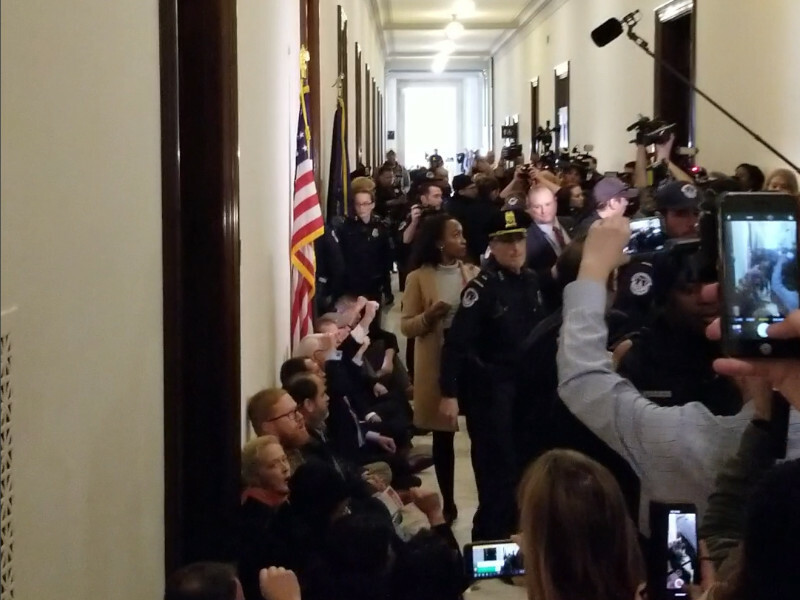 Some went on to occupy Senator Mitch McConnel's office, leading to 12 arrests. The protest began with 33 minutes of silence, one for each of the 33 days some Federal workers have been asked to work without being paid (a sign called this slave labor) and others have been furloughed without pay. At the end of the Atrim protest and later outside Senator Mitch McConnell's office, unpaid workers yelled "No more food banks-we need paychecks!" 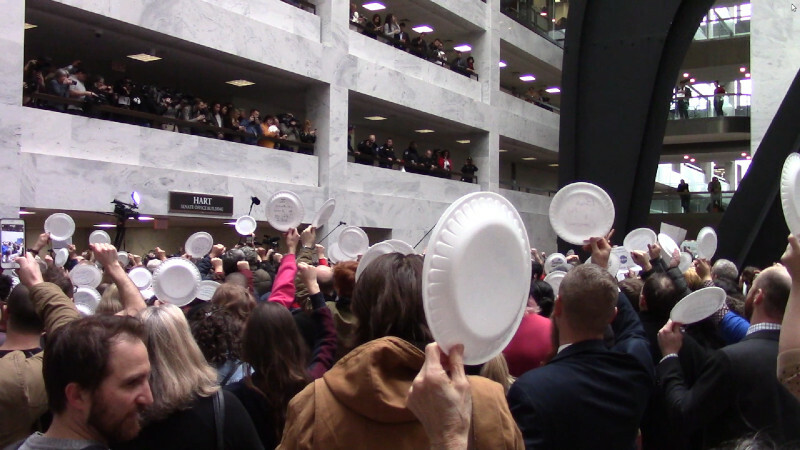 Throughout the protest in the Hart atrium, Federal workers held up empty paper plates symbolic of having nothing to eat. This is an ancient symbol of protest-and of resistance. In the 1500's, a Dutch insurgency against Spanish rule and imperialism began with merchants meeting the Queen of Spain, and one of her underlings calling them beggers. Legends say that at a speech three days later, someone held up a wooden bowl used in those days by panhandlers and yelled "Long live the Beggers!" Thus began the insurgency of the "Sea Beggers" that won the Netherlands independence from Spain. Now it may be up to those holding empty plates aloft to bring Donald Trump to his knees. For Federal government workers to be swarming Capitol Hill like anti-Iraq War protesters in 2007 or women's rights activists against the Kavanaugh nomination last year shows the wheels are really coming off the Trump Train. Government workers going to jail over missed paychecks is the sort of chaos which is commonly associated with the last days of a regime. Increasing numbers of TSA airport screeners are refusing to work as they are NOT getting paid but are expected to buy their own gas to get to work, use other funds to buy food and pay rent and utilities, and so on. If enough TSA workers sick out or walk out to ground the airlines, some say Trump's shutdown will end the next day as all the rich people find they can no longer fly. The strategic importance of the shutdown debate has grown and grown. 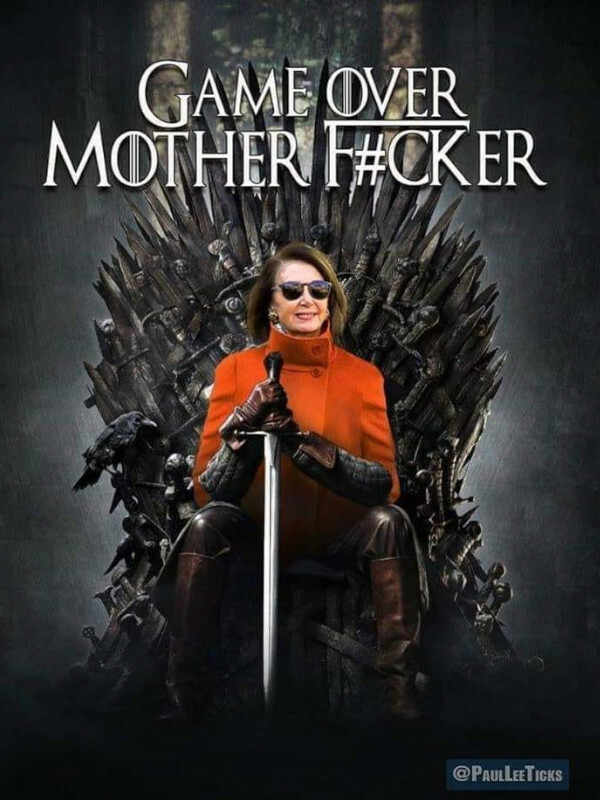 Trump has shut down the government because even the Democrats have grown a spine and are refusing to include money for his wall (the centerpiece of the Trump racial agenda) in the budget. In a snit Trump has decided his racial agenda and wall are more important than all other government operations combined and refused to sign any funding bills without the wall. Whoever wins this fight will be in position to dominate the other party all the way to Jan 20, 2021. If the Democrats fold like in 2007, Trump will OWN them. This also may determine Trump's ability to mobilize his base and get within election-stealing range of winning his 2020 re-election bid. If Trump folds, his nighmare presidency is effectively over. Thus, many believe a Senate veto override vote after something like a TSA strike that grounds all air traffic is the only thing that will end the shutdown. One other issue (again a racial one) is in play: while the shutdown endures, money owed under treaty to Native American tribes by the US government is not being paid. This is a violation of international law, and of the US Constitution that declares treaties equal in weight to itself. On top of all else, many of these treaties were peace treaties that ended wars. Presumably Trump would say that people with only light hunting weapons and not enough food are welcome to go back to war with the United States if they don't like having their treaties broken. That's what the US has always done when they break treaties to get more land for things like uranium mining or fracking.